I’m not really one for war movies and stuff, and I admire those who are brave and selfless enough to join any kind of battle field, be it the Army, the Navy, the Air force, etc. Kudos to you all for real! Now, in those war movies you all like to watch, have you ever seen a soldier on the front-line not use his/her weapon in the midst of battle? I mean, one can’t hope to win any kind of battle without some sort of weaponry…that would be a futile attempt. So, why, as Christians do we think we can do this…fight without a weapon? We do this every day when we attempt to fight the enemy of our souls with our own devices, instead of using the weapons that we've all be given, “…for the weapons of our warfare are not carnal but are mighty in God for pulling down strongholds…” (2 Corinthians 10:4). It’s sometimes easier to give up than fight. Actually…it is always easier to give up than fight. I know sometimes I've been tempted to hightail it out of the battlefield so I wouldn't have to keep fighting. It was all so tiring…”did everything have to be a struggle?” I often thought. I then realized that I was fighting using my natural devices (positive-thinking, forcing myself to be happy, etc). I was “boxing like one beating the air [1 Cor. 9:26], thus tiring myself out. Don’t get me wrong, there’s nothing wrong with positive-thinking, but positive-thinking without involving God will not help you win the battle. It may help you out in the beginning, but it will not give you the strength needed to endure the battle. Being happy will not help either, for it is the JOY of the Lord that will strengthen you (Nehemiah 8:10). As Christians, we often don’t realize the power we possess. We don’t use the weapons we've been given to fight. Consequently, there are many casualties from the battle: broke-down weary Christians who have no strength or courage to remain in the fight. That must not be! In this day and age, it’s time for the Church to rise up in its authority! It’s time for the soldiers of God to take their place in the battlefield…and fight! Child of God, you must NEVER give up or surrender to the enemy. Now, what does this “battle” look like in the natural? Well, remember that time that co-worker said something to you that got on your last nerve and you were tempted to hit them upside the head? Yeah…and what about the time a good friend betrayed your trust and revenge was foremost on your mind? Oh…and what about now… you've lost a loved one [I cannot begin to imagine what you might be going through if this is your battle]. Will you ‘loose it’ with that co-worker of will you fight, allowing God to shine through you thus enabling them to experience the love of God? Will you pick up your weapon of forgiveness and forgive that friend who betrayed you? Will you pick up your weapon of peace, remembering that even the death of a loved one will not be your undoing and will certainly not separate you from the love of God (Romans 8:38-39)? Use your weapon! What is our weapon then? A weapon is anything designed or used to inflict bodily harm or physical damage. Ephesians 6: 10-17 describes the Christian armor, the armor that every Christian should have on at all times. Now, in looking at the list and verse 17 specifically, we will see the sword of The Spirit mentioned. 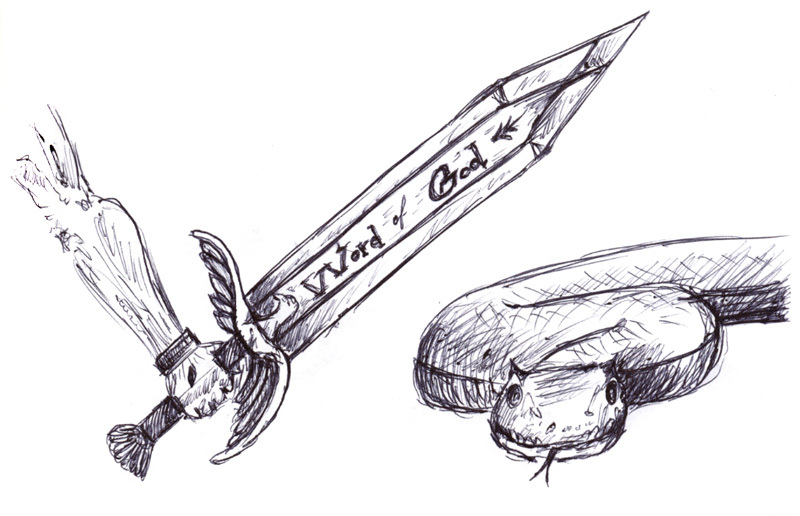 A sword is something used to inflict bodily harm, right? So, the sword mentioned here is our weapon and this Sword, the sword of the Spirit, is the Word of God. We must therefore use the Word of God if we hope to win the battle. Let Jesus Christ be our example, who, while on this earth, found Himself in the battlefield of temptation and fought using His sword, the word of God (Matthew 4:1-11). It’s now time to take that Bible off the shelf, dust it off (if yours needs a little bit of that), and study it so that we will know how to wield this powerful weapon. It may look like you will never be able to make it through the storm you are in, but take heart…God is always with you and will never leave your side (Hebrews 13:5, I love the Amplified version of this...look it up), and He has given you a weapon sure to bring damage to your opponents, the word of God, which is sharper than any double-edged sword (Hebrews 4:12). Grab a hold of your sword and attack! With God on your side, victory is a sure thing. Like the psalmist says in Psalm 149:6, May the praise of God be in our mouths and a double-edged sword in our hands. Amen! I'll stand my ground, and Never give up! Ndidi! I love this song. It is beautifully written and really encouraged me. What a blessing you are! What a great reminder that we are constantly in the battlefield, and yet the battle is not ours but the Lord's.